We raise two different breeds of Boutique Kittens. Each have different and distinct characteristics. we invite you to take a few moments to read each of the breed descriptions. We want to help you find the purr-fect companion to fit your heart's desire and your family lifestyle. 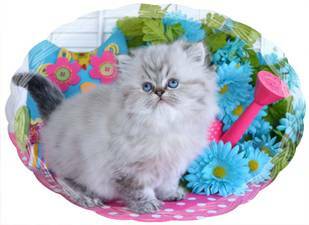 The Persian was a highly prized cat during ancient times and is the most popular cat breed today. This breed has a long elegant coat, a pansy-like face and sizeable, communicative eyes. This breed tends to be most comfortable in a household that is quiet and serene. 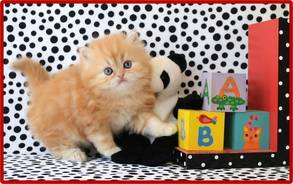 The Persian is a responsive breed that has a lovable and gentle personality. gentle, but not inactive pet. Their coats are thick, beautiful, and silky soft. 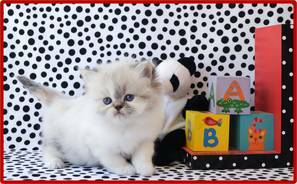 Click Here to learn more about Himalayans (Colorpoint Persians)! Can't decide which breed you like best? and they can snuggle all the way home in the same pet taxi on travel day! purchasing more than one kitty.